Podere Capaccia is located on a hilltop overlooking the Pesa river valley of Radda in Chianti. The buildings that make up Capaccia are the ruins of a medieval village dating back to the 12th and 14th centuries. After WWII, the farm was abandoned as the owners sought fortune elsewhere. In the early 1970’s the property was revived and quickly developed into an award winning wine producer. The estate is undergoing another rebirth with newly planted vineyards and the construction of a new winery. The future of Podere Capaccia lies safely in the hands of Belgian owner Herman de Bode. 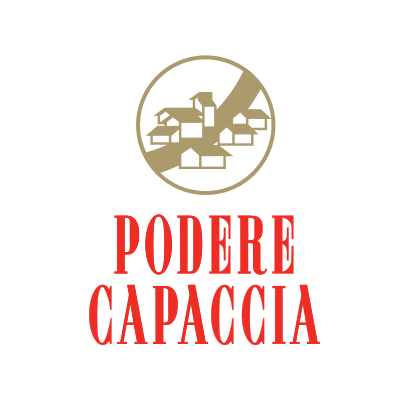 Podere Capaccia is dedicated to creating the highest quality wine with exceptional grapes. Our limited production is a reflection of a rigorous selection of the best grapes from our vineyards. By lowering production in the vineyard we increase the quality of our wines. We sell our products online in boxes of 6 (1 item selected = 1 box of 6). Please contact us directly for other inquiries or to become a distributer. Situated high on the hills of Radda in Chianti, the vineyards of Podere Capaccia are blessed with ideal grape growing conditions. The soils are prominently sandstone, limestone and shale with exceptional drainage and structure that allow for deep root growth. With an altitude of 550 meters above sea level, the air temperatures cool down at night even during the hottest period of the summer, this allows for a slow and balanced maturation of the fruit. With a southern exposure, the vineyards are able to receive all the necessary sunlight to ensure that the grapes achieve perfect ripeness. Have a look through a gallery of Podere Capaccia and the land that is steeped in history. As early as the 1600s the area received acclaim for wine production as wine was already being exported to England. Read more about the history of Podere Capaccia here. Radda in Chianti was settled in ancient times and its Etruscan history was confirmed by recent archeological finds. In the 1300s it was the capital of the League of Chianti and the village was subject to much turmoil over the following 200 years as the wars between Florence and Siena raged. In 1550 Florence released Radda to Siena and the region saw a period of peace and in 1774 Radda gained its status as county. As early as the 1600s the area received acclaim for the wine production and the wine was already being exported to England. Wealthy Florentines began to purchase property and form an organized agricultural production. In 1716 the Consorzio of Chianti Classico was formed, Radda is one of the four counties that is entirely confined within the Chianti Classico growing region. The strategic position of Capaccia lent itself well as a lookout for approaching enemies. The original tower of the borgo was built in 13th century and served a pivotal role in the war between the Ghibellines of Siena and the Guelphs of Florence. This war raged for centuries and strongholds situated on high overlooks were extremely prestigious. Capaccia underwent numerous takeovers by the rival forces. 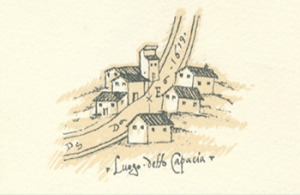 In the years following the unrest, more buildings were added on to the original tower structure of Capaccia and in a document dated 1619 all of the current six buildings are present. This illustration can be seen below. During this time the estate of Capaccia was part of the “mezzadria” culture that dominated the Tuscan area. This form of sharecropping was common in the agricultural areas of Italy and most widely used in Tuscany. The olive orchards, vineyards and chestnut trees were cultivated by families that shared the crop with the landowners. In the 20th century the “mezzadria” agreements were outlawed and many farms were abandoned. Podere Capaccia was part of the Conti Ginori estate that included Castello d’Albola. In 1974, after decades of neglect, the Conti Ginori decided to sell the estate to the Pacini family. The Pacini family had to fight their way through unpenetrable brush with machetes to arrive at the borgo and once they removed all the berry briars they began their work. Over the next 30 years, Giampaolo Pacini created exquisite wines and Capaccia became popular destination for tourists and journalists. 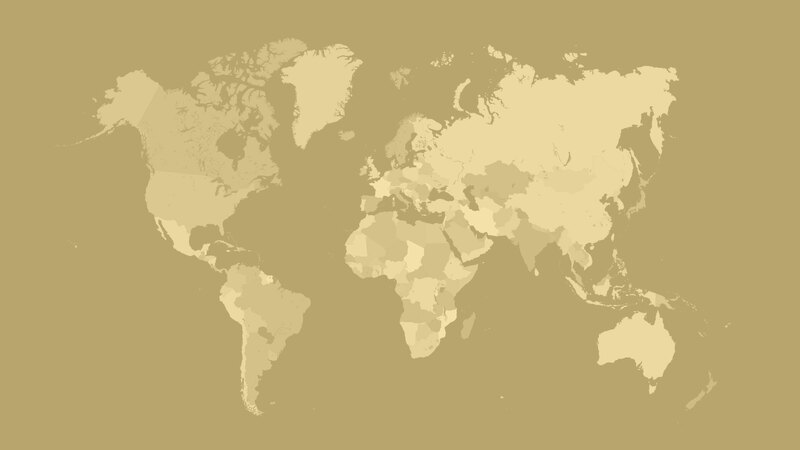 The wines of Podere Capaccia would find themselves at the top of every prestigious list, receiving accolades from all corners of the world. 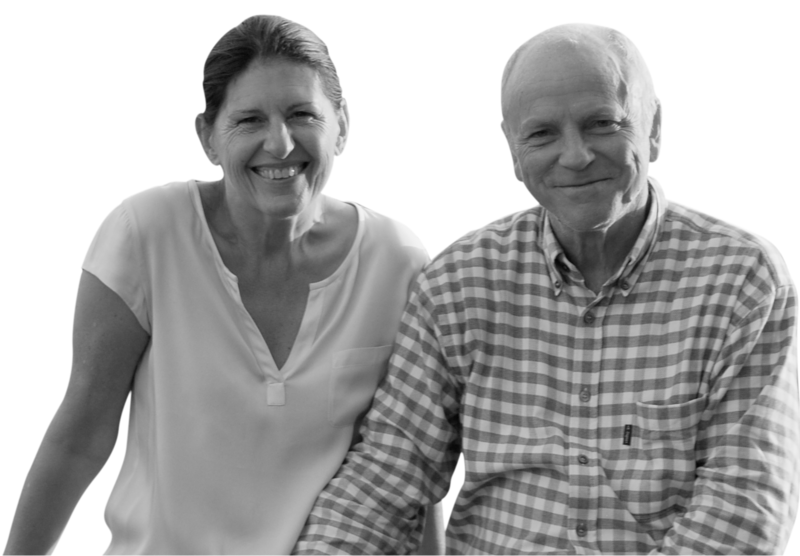 The mission of creating world class wine from Capaccia continues with the Herman De Bode. He assembled a team of people who share in his vision and who are dedicated to the long term goals ahead. This majestic estate continues to evolve with the changing times as it has for 800 years. Capaccia can be seen rising above the valley of Radda in Chianti. The ruins of the abandoned hamlet are in the process of being restored to original splendor. After WWII, the homes were left vacant for decades and the stone walls crumbled in the elements. Two of the buildings were restored in the 1970s to serve as the winery and barrel room. In 2016 the new underground winery will be constructed and the entire production will be moved out of the hamlet. Subsequently, the restoration of the stone buildings will begin. Pisola and Dotto keep watch on the vineyards and make sure deer and wild boar stay far away from our precious grapevines. For generations, the people of Radda in Chianti have been coming to the wooded area that surrounds Capaccia to collect the fallen fruit “marroni” chestnuts in the fall. In recent years, the chestnut forest has been neglected and the forest has become overgrown and unproductive. The owner of Podere Capaccia and tree aficionado, Herman de Bode, is dedicated to returning the forest to its former state of grandeur. Our olive trees are planted on large terraces that surround the Capaccia estate. The trees were planted after the 1985 freeze that decimated the Tuscan olive orchards. The olive harvest begins in late fall after the first frost and the olives are milled at a frantoio in a neighboring village. The olives produce an elegant olive oil that possesses delicate fruit and pepper aromas. The harvest begins at the end of September and beginning of October. The grapes are picked by hand in small bins and then gently destemmed and selected before going into stainless steel tanks. The fermentation is temperature controlled and the must is pumped over throughout the two week maceration. After the pressing, the wine is racked into French oak barrels and wine casks for the malolactic fermentation. The wine is monitored over the following 12-18 months before blending and bottling. The wine then is refined in the bottle for at least 6 months before being released. 2016 © Podere Capaccia. All rights reserved.